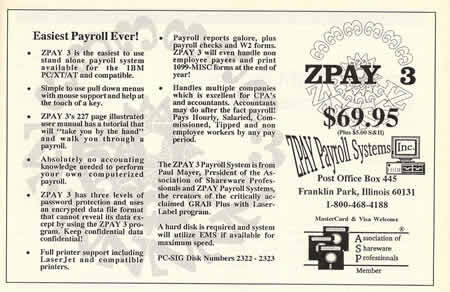 Our History - Payroll Software from ZPAY Payroll Systems, Inc. 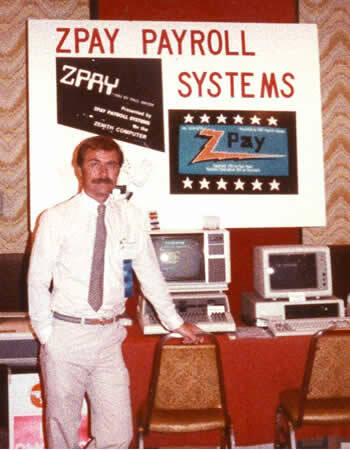 The History of ZPAY Payroll Systems, Inc.
Back in 1976, Paul Mayer our President, had a friend that worked at Heathkit, who was very persistent that Paul buy one of their new build your own computer kits. The H8 kit was just out and Paul's friend Al Olander brought one of these new toys home that he had built and invited Paul over. There was not much software back in 1976 for personal computers but Al did have a copy of the original Adventure Game. He sat Paul down at his new H8 computer and showed him the adventure game. Paul loved the challenge provided by this logical problem solving text game. It must have been about 2AM when Al finally demanded that Paul stop playing the game and go home so he could go to bed and get some sleep. That next morning, Paul who was down at his downtown Chicago photography studio, called Al at the Downers Grove, IL Heathkit store. Paul told Al to wrap one up one of those kits for him and be sure to include the adventure game. That was the first of six computers that Paul would build for himself and others. Now that he had a computer, he needed to find some software that could be used in his Photography business. As this was the early dawn of personal computers, not much was available. There was a simple payroll program in the Heath Users Group Library that was written in Basic for HDOS, the Heath Computer's operating system. Even though the studio's payroll by hand took up to four hours a week, this clumsy basic program didn't save as much time as Paul wanted. Paul bought books on programming and started to become a self taught programmer. He wrote his first payroll program from a users perspective about the time that Zenith bought Heathkit and called it ZPAY. Paul had learned Basic first and used the MBasic compiler to compile his programs to make them run faster. After a number of his business friends saw what he had, they urged him to sell the software commercially. 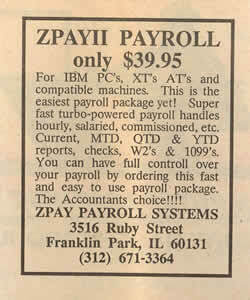 So in 1983, ZPAY Payroll Systems was born. 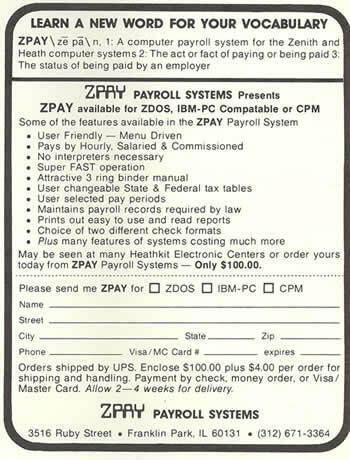 At that time, ZPAY was available for HDOS, CP/m, ZDOS and the new DOS from IBM. Early ads in computer magazines, business newspapers and magazines were the vehicle to launch sales for this new commercial venture. 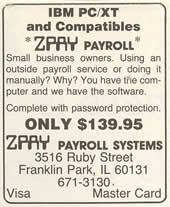 This is an early 1983 ad that we believe is one of the oldest ads for ZPAY. Here is an ad that was in a number of publications in 1984 and 1985. Most sales during these years was a result of print ads. Paul also appeared at Computer User Groups with ZPAY to sell his software. One of the earliest was the Heath Users Group Convention in Chicago, Illinois. Here is a photo of Paul in his first computer show booth. After creating ZPAY in Basic, Paul taught himself to program in Pascal using the Borland Turbo Pascal compiler and spent a year creating ZPAY II. This new release was designed for DOS as that was the future at the time. So CP/m, HDOS and ZDOS were dropped as supported platforms. ZPAY II was also uploaded to Bulletin Board Systems, CompuServe (actually called MicroNet in the early days), GEnie and passed out as Shareware any place Paul could find. This was the new way to go where you'd give out trial versions of your software and if someone liked it, they would buy it. As you can see by this next ad, the price was dropped to be compatible with other Shareware programs. It was 1986 and Shareware was growing as the new way to buy software. Low cost and the 100% guarantee, you tried it before you bought it! Paul was writing the Beginner's column in Shareware Magazine during the 1980's and in exchange received free advertising in the magazine and with the release of his new improved ZPAY 3, took advantage of it with large display ads like this one. Paul was one of the first members of the Association of Shareware Professionals and their third President. This allowed him to appear at many large computer shows such as PC Expo and COMDEX where the ASP would have a booth where members like Paul could display their software to users, buyers and the computer press. There were great times as Paul got to know many in the industry that came to know the quality of his software. In 1993, Windows was becoming the operating system of choice and PayWindow was released. Created for Windows 3.1, this program was the payroll from ZPAY for the next ten years. 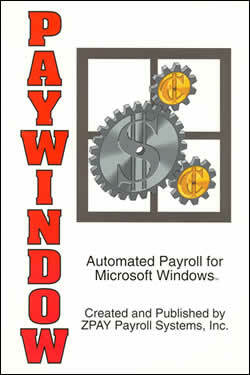 Then on the 20th Anniversary of ZPAY Payroll Systems, Inc., we released PayWindow 2003. The new state of the art payroll program that had incorporated users suggestions and feature requests accumulated over 20 years. This new release has won just about every award there is including the top honor of being chosen as the Best Business Application for the year 2003 by the Shareware Industry Conference. In 2005, PayWindow was the People's Choice Award winner for the Best Business Application at the 2004 Shareware Industry Conference. That my friends is the story of ZPAY Payroll Systems, Inc. It's been one heck of a ride from the beginning of personal computers to the day where almost every home and office in America has one!